The state of Utah is back in the news, but this time it's not about Gary Coleman. The state's capital, Salt Lake City, has announced a $10,000 matching fund for neighborhood business districts through their economic development assistance program. The fund is designed to assist business districts in organizing or meeting individual district needs such as beautification or public safety projects, repairs to roads or sidewalks, collective marketing tools, or creating collateral to benefit their businesses. Up to $2,000 in business grants will be awarded for each project and must be matched by the business district. Projects must contribute to creating a strong economy and shared prosperity to local businesses. 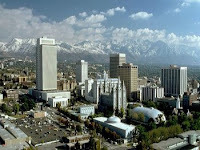 To be eligible, applicants must be registered with the State as a non-profit organization or use the money to create the non-profit organization; must provide services within the Salt Lake City limits; and must be a neighborhood business district organization. The deadline to apply is June 11, 2010.